Today, with much relief, I present the first Policy Address in my term of office to the Legislative Council. During the past three months, the community has voiced a lot of expectations towards this Policy Address. I have listened to them all. I appreciate that many issues in the community require the Government’s attention. 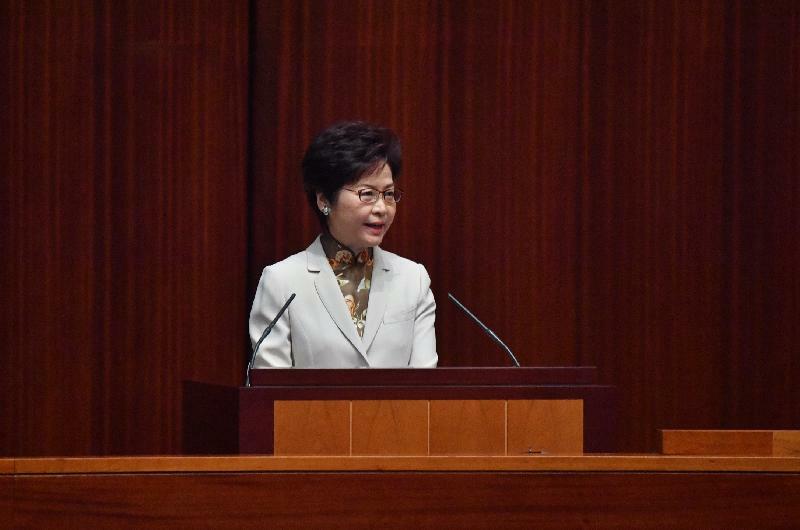 At the same time, I have accepted the suggestion of the Non‑official Members of the Executive Council that I should make use of the opportunity today to share with Hong Kong people my governance philosophy and to highlight some of the specific measures, rather than following the previous practice of spending two to three hours reading out the Policy Address. Without the constraint of a time limit, the Policy Address I deliver today runs to some 49 000 characters. It comprehensively covers such areas as good governance, diversified economy, nurturing talent, improving people’s livelihood, liveable city and connecting with young people. I hope that when you read it, you will get a better grasp of Hong Kong’s current situation as well as the vision of the Government. That said, I am fully aware that a lengthy Policy Address does not guarantee flawless policies or effective implementation. 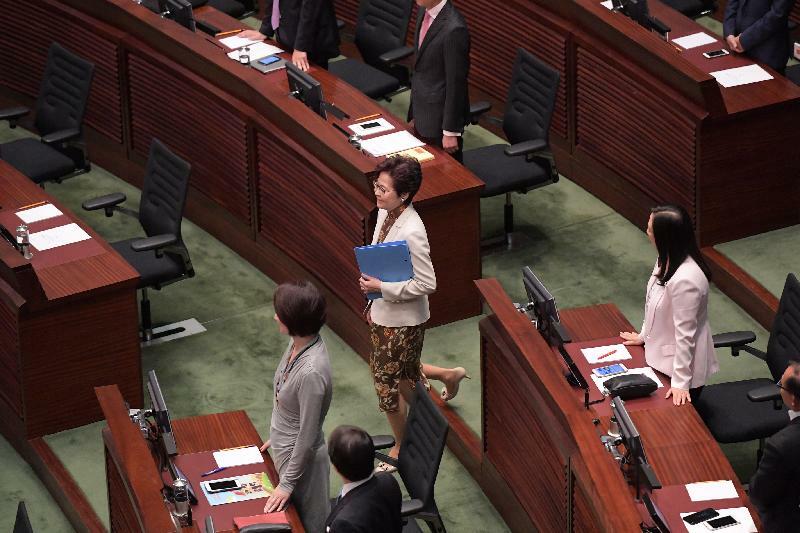 Together with my political team, I will continue to listen to the views of Honourable Members and members of the public with humility, so as to ensure that this Policy Address will set a new starting point for Hong Kong. 2. This year marks the 20th anniversary of Hong Kong’s return to the Motherland, a milestone for us to build on our achievements and begin a new chapter of development. In his keynote address delivered at the Meeting Celebrating the 20th Anniversary of Hong Kong’s Return to the Motherland and the Inaugural Ceremony of the Fifth‑term Government of the Hong Kong Special Administrative Region (HKSAR), President Xi Jinping said in all earnestness that the destiny of Hong Kong has always been intricately bound with the Motherland. In the last two decades, thanks to the support of the Motherland and with an international vision, Hong Kong has kept its distinct features and strengths. This fully demonstrates that “One Country, Two Systems” is the best institutional arrangement to ensure Hong Kong’s long‑term prosperity and stability after our return to the Motherland. It is a workable solution and an achievable goal welcomed by the people. Thus, everybody with a passion for Hong Kong has the responsibility to ensure that, here in Hong Kong, “One Country, Two Systems” advances in the right direction, the obligation to say “no” to any attempt to threaten our country’s sovereignty, security and development interests, as well as the duty to nurture our next generation into citizens with a sense of national identity, an affection for Hong Kong and a sense of social responsibility. 3. Furthermore, through immense contributions made by generations of Hong Kong people and countless challenges overcome, we have established our core values including an independent judicial system, adherence to the rule of law, a highly efficient and clean Government, freedom of the press, respect for human rights, pluralism and inclusiveness as well as the freedom of expression. Since our return to the Motherland, these institutional strengths, rights and freedoms have been protected by the Basic Law under the principle of “One Country, Two Systems”. These constitutional bulwarks and cornerstones of a civilised society and our moral values are unbreachable. The HKSAR Government and myself will, with our utmost endeavours, implement the “One Country, Two Systems” principle, uphold the Basic Law and safeguard the rule of law. 4. In the past three months, in my new capacity as Chief Executive, the honour as well as the immense responsibility of the office are most deeply felt. Some of the decisions cannot be delegated. Certain views must be stated in unequivocal terms. And some of the tasks have to be taken up by myself. What I find most encouraging and touching is the warm support I have received from numerous leaders in our community. Some of them have joined the Executive Council and various statutory bodies or advisory bodies, some have participated in outbound business delegations or summit meetings, and some have spoken in support of Hong Kong through their liaison with Mainland and overseas organisations. I will capitalise on this rich talent pool during my tenure in working on Hong Kong’s future. 5. In the coming few years, Hong Kong is entering a period when opportunities and challenges co‑exist. The Belt and Road Initiative and the Guangdong‑Hong Kong‑Macao Bay Area development of our country will bring enormous opportunities for Hong Kong’s economy. We must leverage the unique advantages of the HKSAR and the support we receive from the Central Authorities. We will continue to respect the rules governing the economy and market operations and promote free trade. With a new, proactive style of governance, strong commitment embodied in the new roles of the Government as well as a new fiscal philosophy to manage our finances wisely, we will inject new and continuous impetus to Hong Kong’s economy. 6. Sound public finance and optimal use of public resources are key to good governance. With years of practical experience in public finance, I fully appreciate the requirements stipulated in the Basic Law of keeping expenditure within the limits of revenues and avoiding fiscal deficits as far as possible. But the fact is the HKSAR Government last went into deficit in 2003‑04. Taking into account the investment return previously injected into the Housing Reserve, the Government currently has a fiscal reserve in excess of $1,000 billion. We are well positioned to use our accumulated fiscal surpluses, which are wealth derived from the community, wisely to benefit the community. On the premise of ensuring the health of our public finance, I will adopt forward‑looking and strategic financial management principles in making investment for Hong Kong and relieving our people’s burdens. 7. On people’s livelihood, meeting the public’s housing needs is our top priority. The Government has no magic wands, but in the past few months the Directors of Bureaux concerned have demonstrated their readiness to think out of the box in a bid to address the community’s pressing needs. We strive to meet public expectations by pursuing new directions and new initiatives. On care for the elderly, we do not see the ageing population as a threat to public finance. We have, instead, taken the opportunity to devise a variety of effective elderly care services. We will continue to devote resources to poverty alleviation as well as support for the disadvantaged in order to build a caring and inclusive society. On education, we will uphold the “Led by Professionals” principle and deploy the necessary resources to nurture our next generation. 8. If I am to put in simple terms the style of this Policy Address, I would say that it speaks of determination, boldness in innovation as well as a conscientious effort to address the needs of the people. 9. Our economy has been performing very well this year, expanding by 4.0% in real terms year‑on‑year in the first two quarters. Entering into the third quarter, our positive economic development has continued with export growing notably and domestic demand remaining firm, displaying an encouraging performance. The local labour market has continued to see full employment, with the employed population increasing steadily and the unemployment rate dropping to 3.1% in recent months. This is the lowest level in almost two decades. Household income has generally recorded solid increases, with the earnings of full‑time employees in the lowest decile group increasing by 4.5% in real terms after discounting inflation. Inflation has dropped for six consecutive years. Barring abrupt negative shocks externally, our overall economic growth this year is expected to go higher than 3.5%, the mid‑point in the earlier forecast range of 3‑4%, and would fare better than the annual average of 2.9% over the past decade. 10. However, in order to sustain these favourable trends for our economy, diversifying our economy is the only solution. The current‑term Government is determined to boost the development of emerging industries in addition to our traditional industries, and considers that both innovation and technology (I&T) and the creative industries have a competitive edge and much potential. They will not only bolster economic growth, but also create quality employment opportunities for our young people. 11. For Hong Kong to catch up in the I&T race and to become an international I&T hub, the Government will step up efforts in eight key areas, viz. resources for research and development (R&D), nurturing a talent pool, venture capital, scientific research infrastructure, legislation review, opening up data, government procurement and popular science education, to propel I&T development and will put in necessary resources. 12. We have set a goal to double the Gross Domestic Expenditure on R&D as a percentage of the Gross Domestic Product from the current 0.73% to 1.5% within the current‑term Government’s five‑year tenure. We have set aside no less than $10 billion as university research funding, and will provide additional tax deduction for R&D expenditure incurred by enterprises. The Education Bureau will make available $3 billion to provide studentships for local students admitted to University Grants Committee‑funded research postgraduate programmes. The Innovation and Technology Bureau will launch a $500 million “Technology Talent Scheme”, including the establishment of a “Postdoctoral Hub”. Our aim is to encourage our young people to engage in research and product development. At the same time, I will strive to attract top overseas scientific research institutions to Hong Kong. In the past three months, several internationally renowned institutions approached me directly and expressed interest in setting up key technology collaborative platforms here. We will also invest $700 million to immediately take forward several projects to develop Hong Kong into a Smart City. 13. To press ahead with I&T development at full steam, I will personally lead a high‑level, inter‑departmental Steering Committee on Innovation and Technology to examine and steer measures under the eight areas of I&T development as well as Smart City projects. The Chief Executive’s Council of Advisers on Innovation and Strategic Development, to be formed by revamping the Economic Development Commission and the Commission on Strategic Development, will also offer ideas and advice to the Government on I&T development to maintain Hong Kong’s competitiveness in the global arena and enhance Hong Kong’s alignment with the development of our country. 14. Creative industries cover a very broad scope. Capitalising on Hong Kong’s established advantages and coupled with financial assistance, the Government will seek to promote the further development of these diverse sectors, in particular the design industry. We propose injecting $1 billion into the CreateSmart Initiative, and providing more resources to the Hong Kong Design Centre to implement a series of measures to reinforce Hong Kong’s status as a city of design excellence in Asia. The Commerce and Economic Development Bureau will identify more room for development through integrating design and industry. It will also foster closer links between Hong Kong’s design industry and Shenzhen and other design cities in the Mainland and overseas to open up new markets for Hong Kong.